By now, most people should be aware that their smartphone constantly tracks and sends away location data and shares them with third party apps. Of course, this can be avoided by turning location sharing off but this would make many apps that need your current location rather useless – think Foursquare, Google Maps or any other navigation or travel app. That’s probably reason enough for most people to share their location. But do you know how often your phone shares its location with, for example, Google? Well, it’s doing that quite a lot. For example, a few days ago, I had a couple of drinks in two bars in Berlin and my phone tracked and sent my current location 300 (!) times to Google. 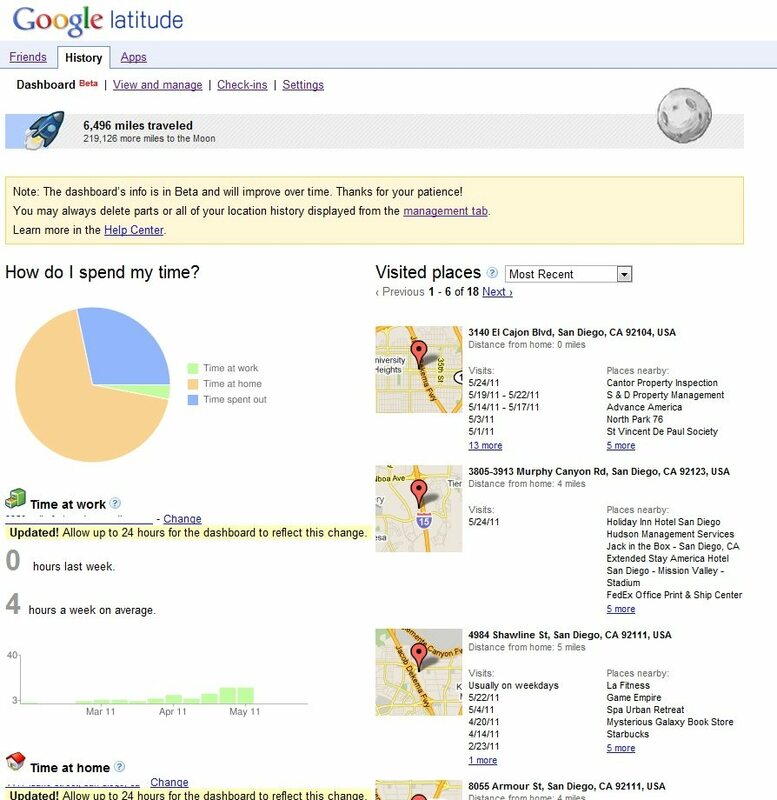 Especially while I was going from one place to another, my location was sent to Google about every minute. For most people that number is probably surprising, if not shocking. 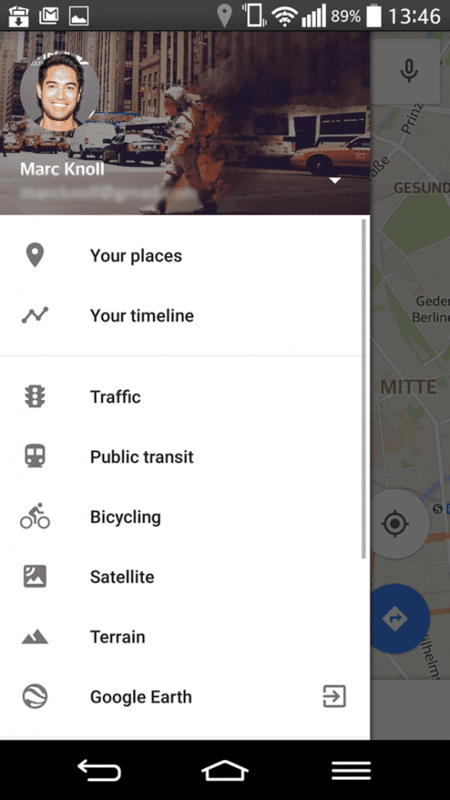 Back in July 2015, Google completely overhauled its Location History tool and changed its name to “Your Timeline“. It comes with a much more up-to-date design and improved user experience. 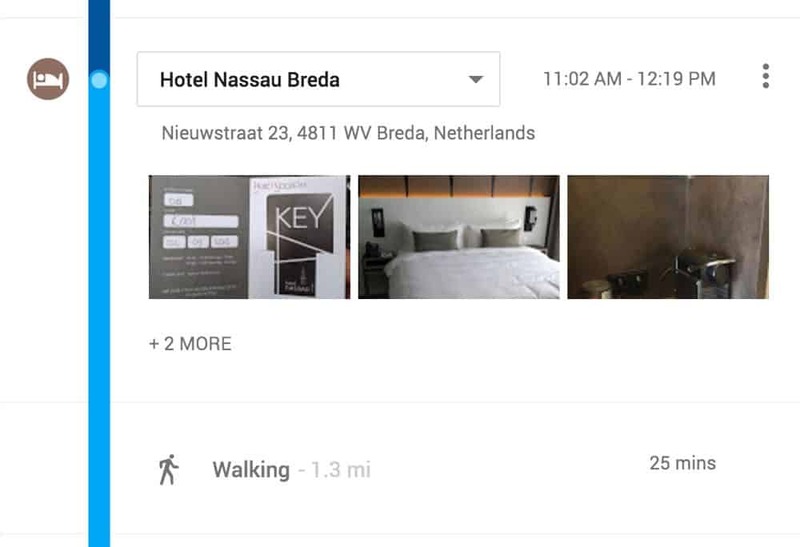 Google wants you to use Your Timeline to “easily remember all the places you’ve been — whether it’s a museum you visited during your last vacation or that fun bar you stumbled upon a few months ago” (or all the bars you went to on last night’s bar crawl). Just imagine yourself dragging along a brush with blue paint behind you at all times, painting a line behind you. That’s basically what Google shows you in your timeline’s map. 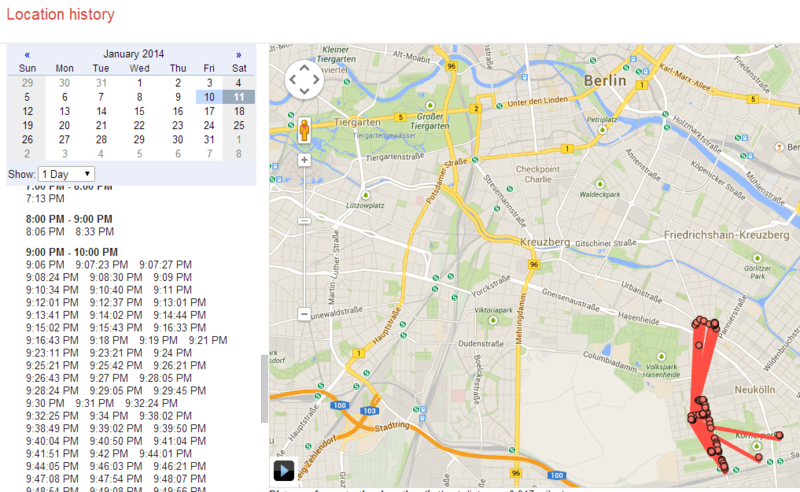 The cool thing is, it doesn’t only show your location history on a map, it also shows you the exact places you visited. Surprisingly, Google is doing that quite accurately and once it’s not so sure, it gives you the option to confirm a suggested place. The gimmick I like the most is that your timeline also shows the images you took at a known location. For example, in the image below you see images I took of the hotel I stayed at in the Netherlands. 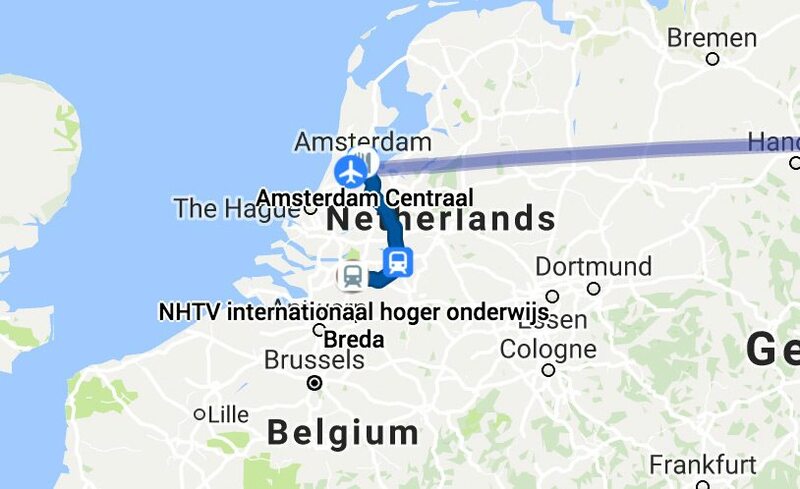 Besides knowing to which places you went, Google also detects, if you travelled by train or by plane and displays that information in your map. If you’re not sure whether you enabled location history or not (many don’t), just head to your personal Google Location History timeline. On the bottom, you should see a card saying if Location History is on or off. Google integrated Your Timeline into the last Google Maps app update, which means that you can access all your stored location history easily on your phone. If you open up Google Maps and swipe in the left sidebar, you should see “Your timeline” as the second option below “Your places”. Inside your timeline, you can select the dates you’re interested in and see all the places you went to, how you got to them and how long you stayed there. In case you feel the need to delete the location history of a specific day, you can do that by selecting the three-dotted icon and then “Delete day”. You can also select individual locations in the your timeline to change the reported place or remove that stop from your day without deleting all the others. Having all the places you went to in the past weeks, months or even years all in one place can be very handy. However, you shouldn’t forget that you don’t have all that data saved locally on your computer. It’s up in the cloud and all of it lies on Google’s servers. Thankfully, Google makes it quite easy for you to turn off location history or delete it completely. If you want to delete all location data, select the cogwheel icon in the bottom right corner inside the Timeline interface and select ‘Delete all location history’. To turn off location history, check the steps below for both Android and iOS. Depending on your device you either need to open the Google Settings app or select the ‘Google’ settings within your main phone settings menu. Select ‘Google Location History’ at the bottom. Now you can either turn it off for your whole Google account or just for one of the listed devices. Open up the Google app on your iOS device. Select Settings > Privacy > Location and then Location History. To turn it off, select ‘Do not store’. All the location data an Android phone sends to Google is stored online and can be accessed on Google’s Location History page. Of course, you can only access your stored locations if you’re logged in with your Google account. What’s interesting, but also a bit frightening, is that you can see your location history from many months ago. I, for example, can go back as far as December 10th, 2012 and see where I was that day. Until the end of last year you were also able to see a dashboard with many useful data of your whereabouts such as how many hours you spent at work, home or going out. However, Google decided to take down the location dashboard, probably because not as many people used the service as they hoped for. Google Maps’ timeline (old Location History) definitely shows that Google is accessing your location in a much more invasive way than most people think. In case you don’t want your location to be stored online, you can disable location history in the settings. Open up Google Maps on your phone, go to your timeline and select the three-dotted icon and then “Manage location settings”. Now, select Google location settings and turn off Location History for your account. Personally, I think it’s convenient to be able to see where you were the last days or months. If you want to review your road trip or just try to puzzle together how last night went down, your Google Maps timeline is your friend! Are you worried about your location data being stored online or are you, like me, embracing Google’s services? Let me know in the comments!